Stay in our wonderful home just a short drive from Whistler!!! Get away from the hustle and bustle of Whistler Village in our peaceful forested development. Our Private Hot tub can be available for your use . Callahan valley Nordic center is located a short drive down the highway and has excellent cross country skiing and snow shoeing . We have our own private lake/beach and tennis courts and relaxing trails for mountain biking. One of the best hiking areas in Whistler is five minutes away, Black Tusk Mountain. Our home has a warm ambiance with Pine floors and heated slate flooring in our downstairs bathroom and hallway. Persian rugs, and antiques add comfort and charm. There are three large bedrooms, each bed has a cozy duvet. The master bedroom is on the main floor. The large loft has table tennis and our den is a great spot to look out over our deck and watch the latest DVD or the birds feeding in one of our several bird feeders. The kitchen is fully-equipped and we have a full-size washer and dryer. You will have a terrific time!!! Our place is 2200 square feet and a great location for family. Hi , from Neil and Marg the owners of this property. Neil is a structural Engineer and Marg is a Nurse. 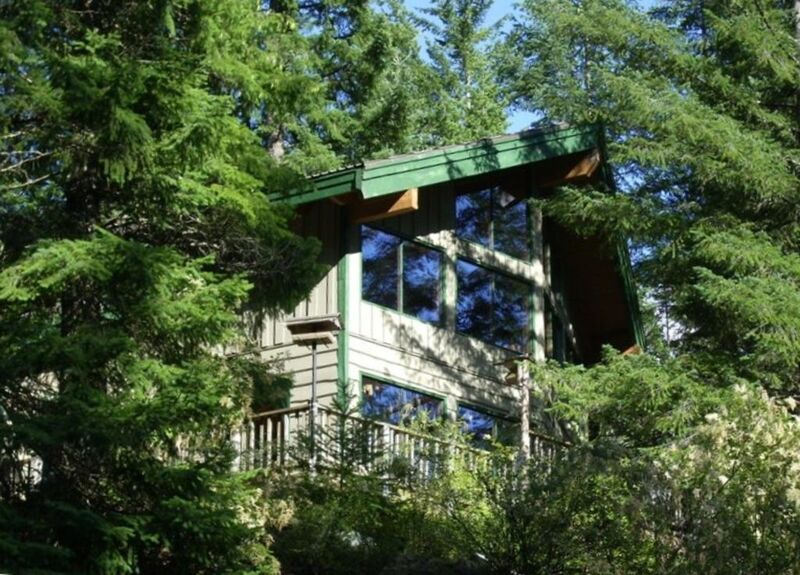 A few years ago we decided we wanted to have recreational property for our growing family, so we carefully looked at various properties in the Whistler area. We decided on Pinecrest for many reasons...the unique setting that provides a peaceful rural atmosphere plus having our own lake, tennis courts, relaxing walking trails and is a short drive to the growing Whistler Resort. We find our area especially wonderful for families with no worries about traffic, kids can bike around our roads safely and it is just a short stroll down to the beach area of our Lake. When we arrived, the cabin was clean but temperature was set at 10 C. So we had to set the thermostat at 22 and to light a fire in the fireplace! Wow! One hour later and for the rest of our one month stay we feeled comfortable and relaxed! Peaceful location. Spa well maintained by pros. The only negative point: no cable TV but unlimited Wi-Fi. As we don't like to look at TV on a cell Phone or a Tablet and as the only old TV in the cabin is not set for Wi-Fi... we had no TV for one month! We were not prepared for that cure but we survived! It is probably easy and not complicated or expensive for the owner to improve that point. We greatly recommand that place for people who want to relax in a rustic setting... far away from the crowd and all associated animations, pubs, etc. Well located, only 25 minutes ride to reach the Whistler parking lot!!! We are sorry the house was cool for your arrival. Our cleaner was unable to clean the day of your arrival , this was done several days prior. We try to conserve energy when the house is unoccupied, since our main source of heat is electric. Regarding the cable issue, we wish you had discussed this with us .We do have an HDMI cable attached to our tv , for easy connection to a lap top. We did have several conversations during your stay, I’m disappointed that we were unable to assist you. We do provide various movies for renters’ enjoyment. We look forward to accommodating you again in the future, qas you mentioned in our guest book. We thoroughly enjoyed our stay in this beautiful cabin. The cabin is full of interesting antique items and collectibles. I almost wish there was a guide book to explain everything! The beds and bedrooms were very comfortable and met our needs perfectly. The kitchen had quite new appliances and was well stocked with dishes, glasses, cups, pots, pans, etc. We loved sitting in the hot-tub and watching the snow quietly fall, and then getting treated to the sight of a train passing just feet away, but about forty feet below, in the railway cut -- truly a unique perspective. When we weren't off skiing we went for a couple of walks in and around the small lakes of Pinecrest. This was exactly what we wanted for a recent 50th anniversary weekend away. Thank you, Marg! Cozy home on gorgeous lake! We loved our time at this property. Surrounded by trees and short walk to the lake. The house is lovely and the hot tub is super relaxing. I am planning our next stay already. Marg and Neil are lovely hosts and there were zero hassles the whole trip. The cabin lacks nothing and the arrival was a breeze. Best VRBO experience to date. Great place to bring your family! The home was very clean and the beds were confortable. We had seven people with us and the home was very spacious and plenty of bedrooms for sleeping comfortably. I enjoyed biking throughout the community as well as a great location for kiaking and canoeing. Was as advertised, quaint, quiet, homey, and funtional. Our whole family enjoyed our stay. The rental amount is subject to change until the reservation is confirmed.